Much has been done to improve the temperament of this hard to find breed. Their natural ferocity has been bred out over the years, leaving owners with large and loving dogs to have in their homes. Not a breed to have around other pets, the Dogue de Bordeaux tends to be possessive of its family and will not back down if it feels threatened by a potential aggressor. Difficult to train, it is important that this breed be socialized from a young age both with other animals and with people, including children. It is not recommended that this breed be around children that it has not been raised with. The Dogue de Bordeaux is highly protective of those it considers to be its family and care must be taken when introducing the dog to strangers. Though the Dogue de Bordeaux is a large breed of dog, it survives well in small, single pet homes; including apartments, as long as it is well exercised. An excellent guard dog, this breed tends to be dominant and can be aggressive and is not recommended for novice owners. Grooming is minimal as the coat is short and does not require regular upkeep. 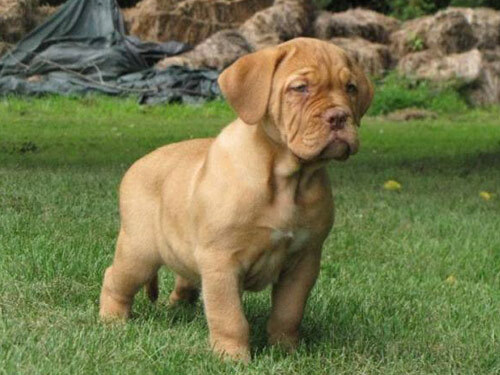 There are not many health concerns for this breed, however those who plan to breed the Dogue de Bordeaux should be aware that females often require cesarean deliveries due to the large heads of their puppies. In addition, the chest of the Dogue de Bordeaux is so wide and heavy that nursing mothers may inadvertently lay on and smother their puppies. Descended from ancient mastiff stock, the Dogue de Bordeaux has had a long history of hard work. It has been a war dog, flock guardian and gladiator sportsdog pitted against lions, bears and other dogs in the ancient Roman arenas. Through the Middle Ages and until the French Revolution, this dog was used as a personal and estate bodyguard; many being killed as they attempted to defend their masters' estates. Thankfully, enough of the dogs survived to be saved and strengthened in the 1960's. The breed has gained in popularity throughout the world and is recognized by the major canine associations including the FCI, UKC, and AKC.